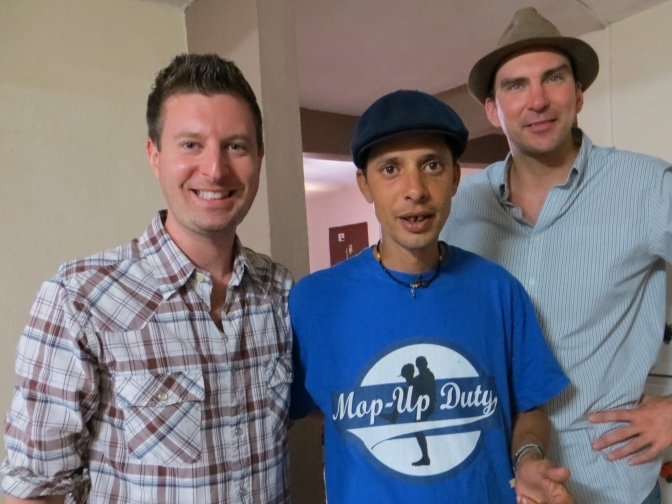 Three years ago I traveled to Havana, Cuba, in order to detail the Cuban baseball experience. I returned to Havana this December to see what has changed and to see if I could learn anything new. Firstly, the entire structure of the Cuban National Series has changed. 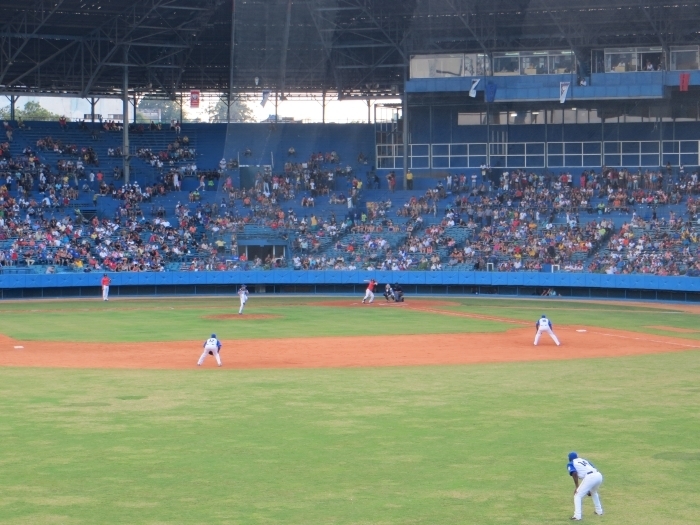 The perpetual basement-dwelling Havana Metropolitanos were contracted, reducing the number of teams in the league from 17 to 16. The best Metros players were absorbed by the Havana Industriales. Secondly, the traditional two-division structure has been abolished. In its place is a sixteen-team one-league format. In addition, the season has been split into two halves. The first half consists of 45 games of round-robin play, followed by a break for the World Baseball Classic. The second half of the season is a playoff between the top eight teams; the bottom eight teams do not play; their season is effectively finished. The number of games for the second half has not yet been determined. There was a little bit of pomp and ceremony prior to the game; uncharacteristic for Cuban amateur sport. The Villa Clara starting lineup was introduced and received only minimal jeering. The hometown Industriales, of course, received a loud ovation. Blue Jays fans, take note: not once did the Havana fans boo any of their own players during the introductions! Following the player intros there was an interesting mix of glad-handing & embraces between a few of the Industriales and Villa Clara players, while other players took the opportunity to smack-talk and make obscene gestures at one another. 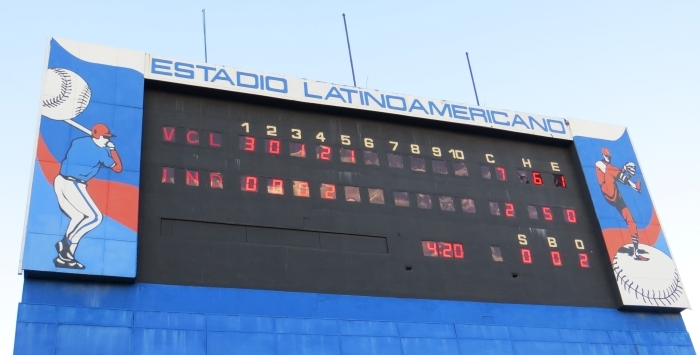 It didn’t take long to be provided with a stark reminder as to how the game of baseball in Cuba is played so much differently than the Major Leagues. The starting pitcher of the Industriales walked the first two batters he faced. 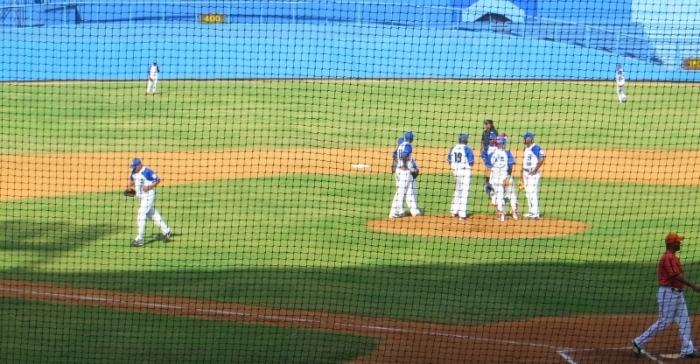 With a 2-1 count to the second hitter in the Villa Clara lineup, Industriales manager Lazaro Vargas motioned to get a reliever up and warming in the bullpen. A sacrifice fly, a walk and base hit later and the starting pitcher’s day was done – with one third of an inning in the books. Malleta was really the only highlight for Industriales fans. A parade of relievers put the Industriales in a deep hole early that they were never able to get out of. These relievers were terrible. All of them would be middle-of-the-pack pitchers in the Intercounty Baseball League. Not only was the pitching terrible, but the defense was atrocious. Routine catches were flubbed, groundballs booted and hot-dogging plays resulted in overthrows. To quote Kenny Powers, the prevailing attitude in Cuba is this: fundamentals are a crutch for the talentless. In one instance, an Industriales player hit a screaming foul ball toward the Villa Clara dugout. All of the players were able to get out of the way except for one, who was plunked in the backside by the foul ball. The fans relished the opportunity to cheer the fact that a Villa Clara player may have been maimed in the dugout. While the relationship between players and umpires in MLB can often times be described as adversarial, the relationship between Cuban players and the umpires is positively cordial. 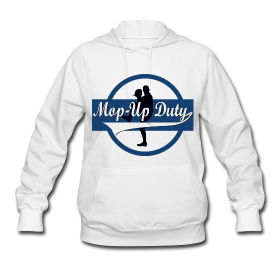 Players will either shake hands or high-five the home plate umpire when coming to bat, sometimes even embracing the umpire and the opposing team’s catcher. 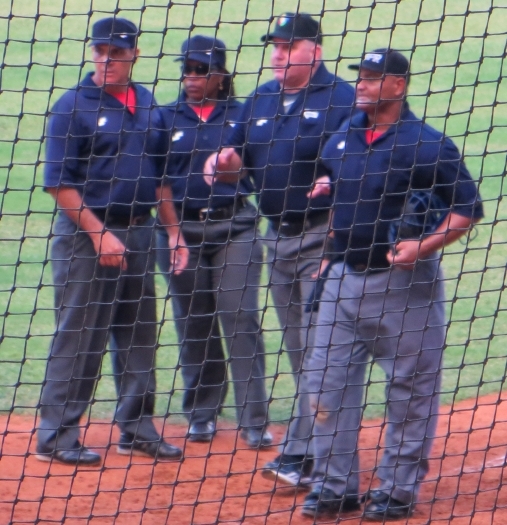 A remarkable aspect of the game was the fact that the second base umpire, Yanet Moreno, was a female. 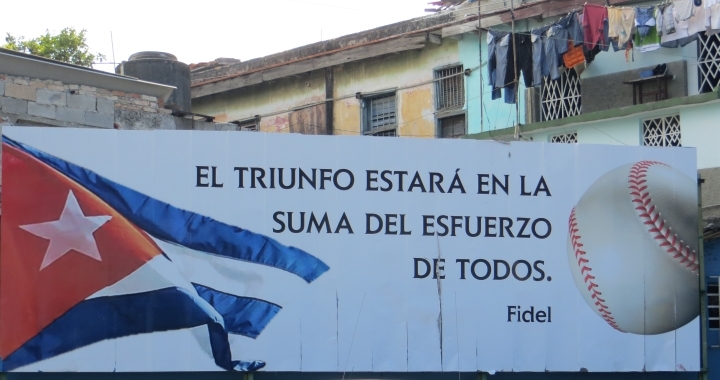 This should come as no surprise as Cuba is making great strides in social equality. How long before female umpires become a mainstay in Major League umpiring crews? As far as the ballpark fare was concerned, I was a little bit more adventurous this time. I tried the Cuban pizza, which is really a baked piece of dough brushed very lightly with a blush sauce. The Jamon y Queso (ham and cheese) that I enjoyed last time has taken a new form. Whereas before it was melted cheese and ham in deep fried dough, the current Jamon y Queso is the more traditional ham-and-cheese-sandwich version. Also on offer was Lechón: a hamburger bun filled with the hacked up meat of a whole-roasted pig served with a vinegary/spicy sauce, similar to those found in Puerto Rico. The highlight was the Chicharrones – basically, deep fried pig skin. While some get nervous about the fact that pig hair is often times still clearly visible as part of the chicharrón, they are without a doubt the most delicious item available at the ballpark. Following the game, I ventured down the Paseo del Prado. ‘El Prado’ as it is sometimes known, is where Habaneros of all ages come to cool off and chill out. As one walks down the Prado, young men sidle up with their incessant offers of cigars and rum, chicas, or tales of family woe, sometimes tailing you as you stroll down the promenade. One such gentleman sidled up wanting to only talk baseball. His name was Lazaro, and he was a self-proclaimed fanatico of the Industriales. When informed that I was Canadian, Lazaro told me he remembered the Blue Jays back-to-back World Series titles in 1992 and 1993. I took the bait hook, line and sinker. He spoke of Lazaro de la Torre (always running), German Mesa (the greatest shortstop to have ever played the game), Omar Linares (who was a good player, but he didn’t play for the Industriales so Lazaro didn’t want to waste much breath on him). His favourite player of all was one I had never heard of: a left-handed hitter named Javier Mendez. I asked Lazaro if he remembered Yunel Escobar‘s time as a Havana Industriale. He said that he did, but only vaguely, since Yunel was very young when he played for Havana and he didn’t make much of an impact. There were others, however, who did know all about Yunel Escobar. In September of 2012, then-Toronto Blue Jays shortstop Yunel Escobar wrote on his eyeblack in silver pen “Tu ere (sic) maricón.” This caused quite a controversy and Yunel was suspended for a number of games. I wrote a piece criticizing certain members of the Toronto media for taking a hard-line stance on such a nuanced issue that many didn’t take the time to understand. 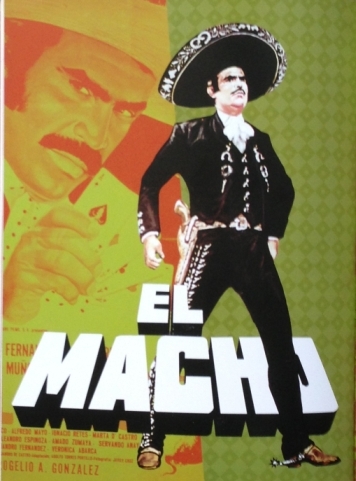 The meaning of the word “maricón” is context-driven: it means different things based on how it is used. It can be used as a homophobic slur but it also has other meanings as well. In bars, at the Esquina Caliente and in the streets of Havana I asked Cubans about Yunel Escobar and what they knew about the maricón incident. He explained that in the cultural context of Cuba, if a Cuban man goes to a bar, he is expected to either order a beer or a shot of rum – straight. If he were to order a mojito, he would be called a maricón. This is in no way means that he is a homosexual; only that he doesn’t subscribe to the Cuban ideal of masculinity and it is a great opportunity to give him a good-natured ribbing. The others I spoke to found the incident mildly amusing, with the word maricón being fairly innocuous. At the Esquina Caliente, when I asked one or two passers-by what they thought Yunel meant by using the word, they said that I would have to ask Yunel in order to know for sure. I was also told that maricón is used as buddy or pal, as is its derivative, marica (in Columbia, marica has no homosexual connotation whatsoever). In Venezuela, according to Omar Vizquel and Ozzie Guillen, it is used as a normal greeting, such as ‘‘What’s up bro? What’s up dude?’ Spanish-speakers neutralize slurs by using them affectionately, calling one another maricón just as they call each other “fatty” (gordito) or “ugly” (feo). Culturally, nicknames based on physical characteristics are of the utmost importance. The interpretation is all in the tone, and maricón is not an expression where a parallel can be drawn to a comparable phrase in English. As Jose Bautista said, it would be an ‘impossible task’ to explain the cultural context of the word. For an expert’s opinion, have a look at this Globe & Mail article written by a 72-year old Cuban-Canadian author. In Cuba, maricón is a context-driven word, just like it is in the rest of Latin America. Attempting to place the word in a North American cultural context – and then apply a definitive meaning – is just not possible. Finally, a few minor notes. I attended a second game – this one a night game – that featured Industriales right-hander Odrisamer Despaigne. With the departures of Yunesky Maya, Aroldis Chapman, the semi-retirement of Pedro Luis Lazo and the retirement of Norge Vera, Despaigne is widely regarded as the second-best pitcher in Cuba, behind only Artemisa’s Yadier Pedroso. Despaigne finished last season with a 2.60 ERA with 128 strikeouts to 66 walks in 169.1 innings pitched. Last season was his 7th season and he is only 24 years old. With that said, Odrisamer Despaigne was not at all impressive on the night I saw him. His fastball sits in the upper 80s and is straight. He lacked command of both his fastball and his mediocre secondary pitches, though this is not normally the case for him. Despaigne is helped greatly by the fact that Cuban hitters swing at anything near the strike zone. If Despaigne is indeed one of the best pitchers to represent Cuba at the 2012 World Baseball Classic, the team is in trouble. The most impressive player on the field other than Alex Malleta was the Industriales’ catcher, Frank Camilo Morejon. He has all of the tools to be an effective defensive catcher: agility, athleticism, smarts, and a cannon for an arm. In 2009-2010, Morejon threw out 23 of 33 would-be base stealers. Morejon has been named to the preliminary roster of the 2012 squad; he was not a member of the 2009 team. Should Ariel Pestano prove to be too much of an old man to handle the workload of a starting catcher in the ’12 WBC, Morejon will prove to be a capable substitution.